Many people consider hair loss or thinning hair to be an issue that affects men, but women also suffer from hair loss and often with devastating consequences to their self esteem. While men and women both deal with issues related to hair loss, there are differences in how this occurs. At RHRLI, we help men and women with a permanent solution to hair loss. It’s a hair transplant procedure called the ARTAS® System and it uses robotic technology to give you a healthy head of hair. We know there are differences in the ways men and women lose their hair and how they approach hair transplant procedures. We want you to know about how hair transplants differ for men and women. Androgenetic alopecia, commonly called male or female pattern hair loss affects both men and women, according to the American Hair Loss Association (AHLA). The main cause of this type of hair loss is Dihydrotestosterone (DHT). DHT is a derivative of the male hormone testosterone. Testosterone is able to convert to DHT, starting the process that leads to hair loss. Women carry testosterone in small levels, but it’s enough to produce Dihydrotestosterone. DHT binds to receptors in scalp follicles and that leads to hair follicles shrinking. Male pattern hair loss is visible in men who tend to lose hair at the crown of their head or at the temples. Women tend to see their hair thin at the crown of their scalp. Women who have mechanical or traction alopecia. This is a non-hormonal condition that comes about when hair is lost due to hair being pulled from the scalp. An example would be women who wear tight hairstyles. Women who suffer hair loss due to trauma such as burn victims, scarring from accidents or chemical burns. Women who’ve had their hair severely damaged by chemicals in hair products are an example of this. Women with alopecia marginalis, a condition similar to mechanical or traction alopecia which is common in black women. 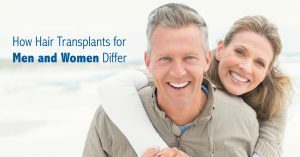 While men can often have some of these conditions, the differences in conditions that men and women seek hair transplant procedures for is the chief difference. But the solution is the same and that solution is the ARTAS® System. We’re the only hair loss treatment center on Long Island that has ARTAS®, which is a minimally invasive procedure that searches for healthy donor hairs and uses robotic precision to transfer them to where they’re needed. To learn more, contact RHRLI today.